Life too busy to attend classes with your dog? Is their behaviour at home or out on walks causing you hurt, upset or embarrassment? Let us get the training started for you and then teach you how to maintain it at home! 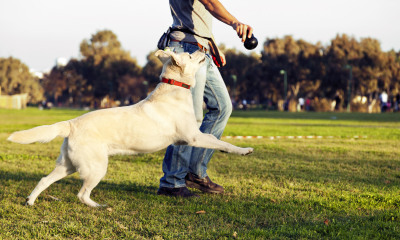 If you have a busy schedule or need help, beyond group classes, implementing basic obedience and impulse control (including loose leash walking), we can help! Our unique training walks allow one of our professional trainers to help your dog learn the skills they need in the environment where they live. Our trainers will discuss with you what your goals and challenges are and work out a step by step plan to achieve these goals. Training walks are offered in packages to save you money as well as ensuring the consistency needed for your dog to learn. Our Walk & Train Programs are suitable for dogs who need basic obedience training for issues like jumping up, walking nicely on the leash, coming when called, etc. Lessons are provided in your home and at carefully chosen outside locations. This program is 6 sessions consisting of a 1 hour meet and greet lesson with your family to define your individual training goals and meet your dog, followed by four 45 minute sessions with just us and your dog, and a final one hour session with you and your dog to teach you how to use your dog’s new training. This program is a longer term package for more serious problems, or for those that want to keep up their training and includes an initial one hour meet and greet session where we work with you as well as your dog, followed by nine 45 minute sessions with just your dog, and finally two, one hour sessions with you and your dog to teach you how to use your dog’s new skills.